Once again, I am in the process of finishing one book and beginning the next. 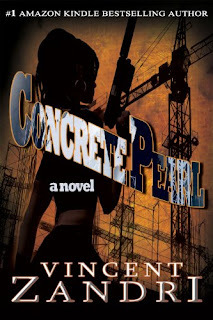 I am going to share the opening lines of Concrete Pearl by Vincent Zandri. The naked man lies on his side along the edge of a steep trench. The newly excavated trench reeks of exposed clay, the rich stench wafting up from the moist floor. Wonderful teaser. I will be adding this one to my tbr list. Hmm...sounds sinister, i wonder if it really is? hmm.. sounds interesting!! New follower!